The PLOTS option in the PROC UNIVARIATE statement requests several basic summary plots. For more information about plots created by the PLOTS option, see the section Creating Line Printer Plots. This example illustrates the use of the PLOT option as well as BY processing in PROC UNIVARIATE. A researcher is analyzing a data set consisting of air pollution data from three different measurement sites. The data set AirPoll, created by the following statements, contains the variables Site and Ozone, which are the site number and ozone level, respectively. The ODS GRAPHICS OFF statement specified before the PROC statement disables ODS Graphics, which causes the PLOTS option to produce legacy line printer plots. 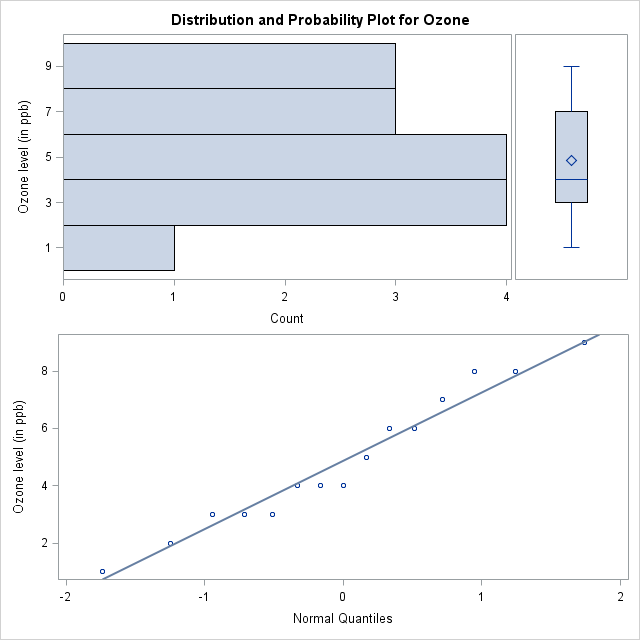 The PLOTS option produces a stem-and-leaf plot, a box plot, and a normal probability plot for the Ozone variable at each site. 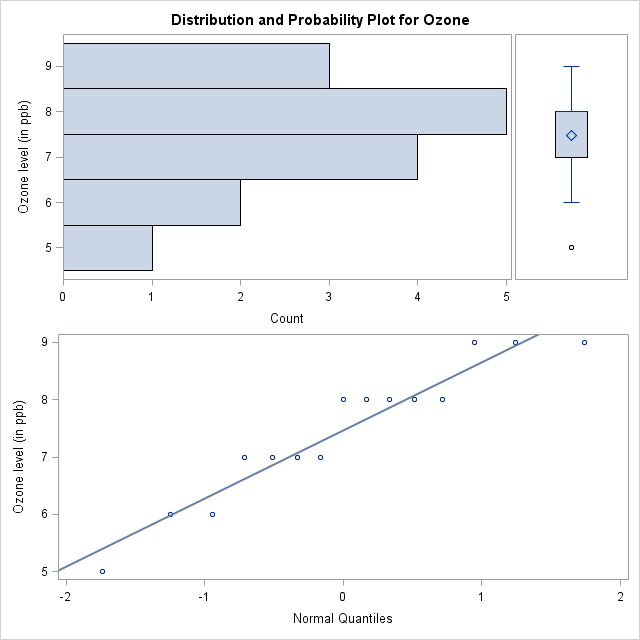 Because a BY statement is specified, a side-by-side box plot is also created to compare the ozone levels across sites. Note that AirPoll is sorted by Site; in general, the data set should be sorted by the BY variable by using the SORT procedure. The ODS SELECT statement restricts the output to the "Plots" and "SSPlots" tables; see the section ODS Table Names. Optionally, you can specify the PLOTSIZE=n option to control the approximate number of rows (between 8 and the page size) that the plots occupy. Output 4.5.1 through Output 4.5.3 show the plots produced for each BY group. 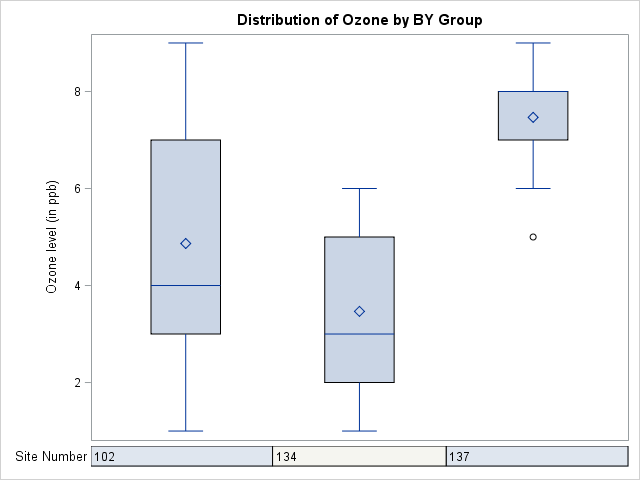 Output 4.5.4 shows the side-by-side box plot for comparing Ozone values across sites. Output 4.5.5 through Output 4.5.8 show the plots produced by using ODS Graphics. 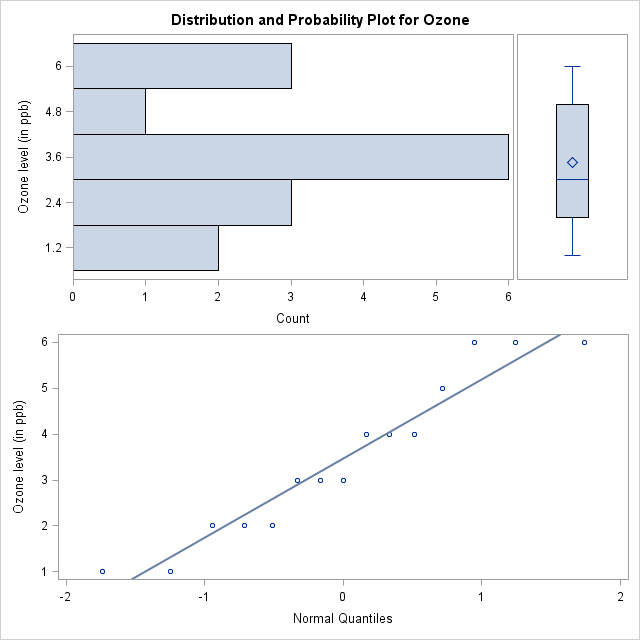 Note that the line printer stem-and-leaf plots are replaced by horizontal histograms in ODS Graphics output. Note: You can use the PROBPLOT statement with the NORMAL option to produce high-resolution normal probability plots; see the section Modeling a Data Distribution. You can use the BOXPLOT procedure to produce box plots that use high-resolution graphics. See Chapter 28: The BOXPLOT Procedure in SAS/STAT 14.2 User's Guide. A sample program for this example, uniex04.sas, is available in the SAS Sample Library for Base SAS software.